Connor: “Star Wars: The Last Jedi” began with a gripping, deadly spaceship battle and a glimpse at the true stakes of the ubiquitous war in the galaxy far away. 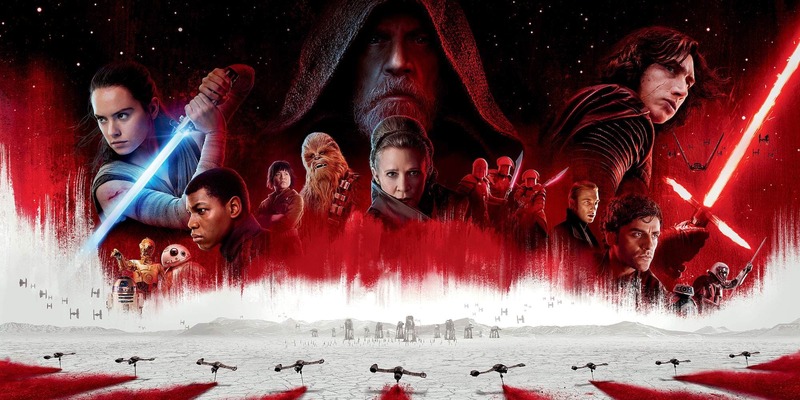 The protagonists, the Resistance (which is just a recycled rebel alliance from the original films), suffered massive losses in the first few minutes of the movie, and the reward for their sacrifices was significant but minor in the grand scheme. “The Last Jedi” set out to show the toll and human element of the dramatic conflict the movie revolves around. But midway through the movie, it transformed into a gutless, lazy formula instead of a movie with any purpose. A theme of the film (one that Rian Johnson’s script beats into you) is the dangers of bravado and risk-taking, but the film seems to take its own advice too seriously. In multiple points, characters were placed in imminent danger only to be improbably saved because Johnson was too timid to put important characters in any actual danger. The best example of this occurs when the hull of a Resistance ship is destroyed, sending General Leia (Carrie Fisher) and her crew into space. Everyone died but Leia, who unconsciously floats back to the safety of the intact part of the ship by the grace of the force. This force ability has no precedent in previous Star Wars and seems so improbable as to be magic rather the force. It’s as though Johnson wanted the excitement of threatening to kill a flagship character, but he was too scared to follow through and saved her in the goofiest way possible. His gutlessness ruins important scenes in the excessively long film because the audience knows that no important characters are going to suffer any consequences. “The Last Jedi” attempts to make feminist commentary—Rian Johnson doesn’t know the definition of subtlety—by promoting Resistance Vice Admiral Holdo (Laura Dern) over lead character Poe Dameron (Oscar Isaac). Initially, it appears that Holdo is a clueless, stubborn leader and too hesitant to make any decisions. Dameron, conversely, wants to make rash decisions that could get him killed. After overruling Dameron several times, the audience learns that Holdo knew what she was doing the whole time. But why shouldn’t Dameron make rash decisions? There are no stakes because no one important ever dies. If Dameron had hopped in the good ole X-wing and started shooting people, this painfully long movie would have ended sooner. The lack of evil character development in the film exacerbates the dullness of what should be tense scenes in “The Last Jedi.” Why is the First Order an evil organization hell bent on ruling the galaxy? Who knows? They’re evil because they just are. Earlier Star Wars episodes also faltered similarly, forgiven only by the widespread nostalgia held for the original films. But this episode started as a more serious, adult take on Star Wars. And at certain moments, Johnson succeeds at this. The relationship between the powerful and evil Kylo Ren (Adam Driver) and strong but inexperienced protagonist Rey (Daisey Ridley) is compelling because it creates a conversation between well-developed, likable characters that have completely opposing ideologies. But when they finally meet in person, Kylo kills his master and asks Rey to rule the galaxy with him. The film offers absolutely no explanation for Kylo’s motivation. Ruling a whole galaxy is not a weekend hobby; you would need a strong conviction and motivation for doing so. But Johnson stops short of showing why someone would have such a lofty, menacing goal. I must concede that this movie sported solid acting performances and was beautiful to look at. There were also multiple funny moments that broke up the tension of some scenes. The positive elements of this movie are difficult to celebrate, however, because the plot is so ridiculous. Johnson boils Star Wars down to a formula: have daring characters make risky decisions, threaten to kill those daring characters and imperil the fate of the galaxy, save those characters by deus ex machina, punish the bad guys, rinse, and repeat. People often mock George Lucas’ writing decisions in the prequel Star Wars trilogy, but Rian Johnson did something far worse: he made Star Wars boring. Henry: One cause of “The Last Jedi”’s controversy is also its greatest strength: its subversiveness. Rian Johnson’s film is expertly crafted by a man who clearly understands the machinations of the modern blockbuster (the themes, plot structure, twists, and every other cliche we’ve become accustomed to) and smartly subverts them. The end result is a film that’s both surprising and thoughtful and includes unexpected moments that stay with you once the shock wears off. One scene in particular, late in the film, best exemplifies this. The film’s main villain, Supreme Leader Snoke (Andy Serkis) has captured Rey and plans to have her executed by his henchman, the son of Han Solo and Leia Skywalker, Kylo Ren. But Kylo has other plans. In a shocking twist, he unleashes Luke Skywalker’s lightsaber into Snoke, killing him. Prior to his death, Snoke was a prime example of modern blockbuster cinema’s villain problem. All of them follow roughly the same, uninteresting template: they have massive powers, they desire to destroy or take over the world (for vague reasons), and they spend most of their screen time ranting and raving about all the terrible things they plan on doing. While Serkis is a skilled actor who brought what he could to the role, Snoke just wasn’t that interesting or original. With Snoke’s death, Johnson literally slices his cliched villain in two, replacing him with the far more compelling Kylo. Snoke’s death comes as a shock, in large part due to how prevalent villains like him are. But perhaps more importantly, the twist gives the Star Wars franchise a compelling antagonist going forward. Unlike Snoke, Kylo is genuinely complicated and compelling. Scarred by his past and searching for a way forward, his motives are more clear and understandable than most modern movie villains and he is far more psychologically complicated than Snoke. He’s terrifying not because of his booming voice or imposing stature, but because he’s deeply human. Following Snoke’s shocking demise, his guards turn on Rey and Kylo, beginning one of (if not the) best fight scenes in the franchise. Normally, the lightsaber battles in Star Wars involve the Jedi and the Sith, those who stick to the light side of the force and those of the dark. In addition to the story twists, the actual fight scene itself is absolutely spectacular, with its mix of intense fight choreography, excellent camera work, and staging that fluidly moves between Rey and Kylo. There is more to say about the film and all the ways that it wisely deviates from cliche and franchise formula. But what ultimately makes “The Last Jedi” so great is how Johnson tells a refreshingly new and original story, one that builds upon what came before but goes in a new direction.